After a brief flurry last year in which a number of limited release beers made their way from Mornington Peninsula Brewery's canning line and into your hands under the #tinnage banner, there had been something of a lull. 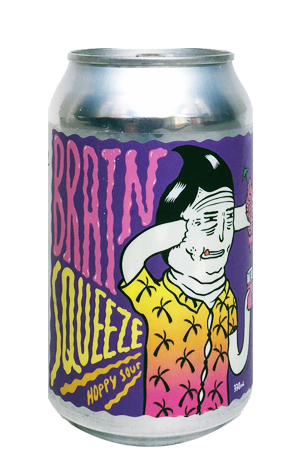 But, at the same time as the brewery is revealing the first fruits of its barrel program, the one-off tinnies return in the shape of Brain Squeeze, a beer previously only seen on tap. This time around, the increasingly outlandish artwork continues – here, it's a spot of Beavis and Butthead-esque action with a guy in tight-fitting Hawaiian shirt ramming his fist through his head and emptying the juice from his brain into a glass – as the brewery releases its first packaged sour beer. It's tagged a "hoppy sour" and, to paraphrase the iconic British TV ad, it does exactly what is says on the tin. That said, it does both unobtrusively, with the dry-hopping contributing soft tropical and lemon citrus characters and the kettle souring providing an acidity that, along with the spritzy carbonation, is refreshing more than bracing. Don't be surprised if this returns when the mercury starts rising again.